2 gloves of garlic, sliced or chopped. Brush the the mushrooms and wash them. Cut a 1/2 of the stem off. Combine everything but the mushrooms into a pan and bring to a boil. Add the mushrooms and boil covered for 10 minutes. Refrigerate overnight. Serve as an apetizer or as part of an antipasti plate. To avoid wasting the rest of the red bell pepper, why not make marinated red bell peppers at the same time? Looking for an alternative to marinated mushrooms? Try Mushrooms a la grecque. This looks like it is easy to do and tasty! I’m going to try it and let you know how it goes. Thank you, Julie. Let me know if you have any suggestion on how to improve this recipe. I’m always on the lookout for something tasty! A few dollars lost over some mushrooms is better than a few days lost over the toilet bowl. of mushroom is not delute with agua. Hi, I want to make this and put the marinated mushrooms in decorative jars to give away. Will they keep unrefrigerated? What would you suggest? Eda, I would think they’d be ok for a few days. Especially with the vinegar. For longer, I’d suggest looking into sterilizing them (and using appropriate jars). Thanks for this recipe. It came up when I googled “marinated mushrooms”. I just made them and they smell good… I’ll taste them tomorrow. You should add a line to your recipe about whether you should refrigerate them in the liquid (I’m assuming YES so that’s what I’m doing). I hope they turn out like the ones in the italian food section of the grocery store. It’s much less expensive to make my own! I used sliced mushrooms and just smashed the cloves of garlic (rachel ray style!) with the side of the knife. I also added a bay leaf and a sprig of thyme. I like to put my own spin on it! I may add a few red pepper flakes next time, too… I’m hoping to serve these on an antipasto platter for the superbowl. I’m serving them with the pickled veggies from here: http://smittenkitchen.com/2006/09/the-great-souse/ which I love. Yes, I do refrigerate once they’ve cooled down (although with the vinegar, you can probably keep them out for a while. That pickled veggies recipe looks very good and I’ve actually been looking for one for a while, so I’ll give it a try. Thanks! @Mera, something I’ll need to try! Anyone can point out to a good page for explaining how to proceed with preserving the mushrooms? I am also looking for a recipe I used over 20 years ago,(lost my recipe BUT NEVER forgot the great taste! )…Your recipe looks close BUT there isn’t any oil in yours…did you happen to forget to add that ingredient? Carol, you could certainly add olive oil before after the mushrooms have cooled down (about 1 TBSP). I like it without the oil myself, but maybe recipes do use some. I have made these and love them and now want to mason jar them as little ‘thanks for having us for dinner’ etc. gifts. Does anyone know the proper way to seal them so that they last? Or will they simply last for quite some time do to vinegar etc? Kelly, the vinegar will indeed help preserve the mushrooms for a good 2 weeks in the fridge, perhaps longer, but they are usually gone much quicker. This looks awesome! I’m making marinated mushrooms for Thanksgiving per my mom’s request and searching for recipes–yours looks fab. 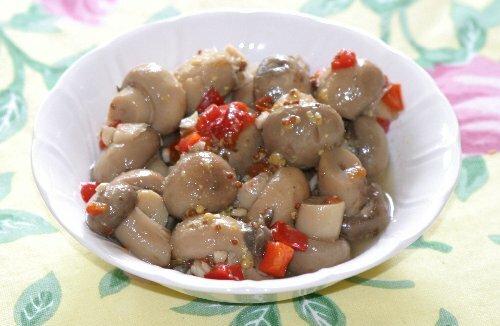 Hey There, I have been searching for the perfect marinated mushroom recipe for a while, so I’m really excited to try yours, but I’m wondering if you could tell me what kind of vinegar you use. Is it just regular white vinegar, or apple cider vinegar?! Thanks! I tend to prefer red wine vinegar, especially Jerez vinegar for its distinctive taste, but apple cider, or white vinegar also work great. I encourage you to experiment to find which one you prefer. From the few sherry vinegar I can find at local supermarkets, I tend to prefer “Don Bruno Sherry Vinegar Vinagre De Jerez”. Your dish is much easier than i thought. So how long will this dish last when i preserve it in the refrigerator? Once you marinate your mushrooms, there is no need to roast them. Actually, I’m not sure this would work so well.